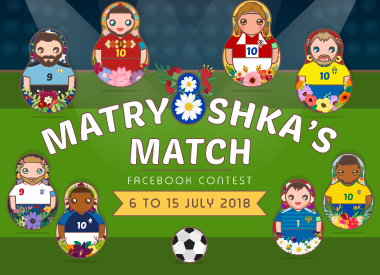 From 6 to 15 July 2018, come revel in some Russian fun in the Matryoshka's Match Facebook Contest! Olé, olé, olé! We’re more than halfway through the World Cup! To keep up with the football frenzy happening in Russia, we’ve devised a match of our own as a homage to this year’s World Cup host. So, come revel in some Russian fun in the Matryoshka's Match Facebook Contest! Check out our take on the iconic Russian doll, and put your reflexes to the test for a chance to win a pool of amazing prizes*! Look out for the contest post on our Facebook page @fps.northpointcity. Snap a screenshot when the jersey tops on all Matryoshka dolls correctly match their bottoms. Upload your screenshot in the comment section, and share with us a creative cheer of your favourite World Cup team. This contest ends on 15 July 2018, 11.59pm, and twenty-five winners will be announced on 18 July 2018. *One prize pool per winner consists of: 4 tickets to Singapore Garden Festival tickets and a $10 retail/dining voucher. This contest is open to all Singaporeans and Permanent Residents of Singapore, currently residing in Singapore, over 18 years of age, except employees of Northpoint City and Frasers Property Management Services Pte Ltd, its advertising agencies, tenants of the malls of Frasers Property, their immediate families or anyone else connected with this promotion. No third-party entries, bulk entries or entries submitted by agents will be accepted. The Management of Northpoint City reserves the right to verify the eligibility of each participant and may require such information as it considers reasonably necessary for the purpose of verifying the eligibility of an entry. The prizes may be withheld until and unless the Management of Northpoint City is satisfied with the verification. 1. 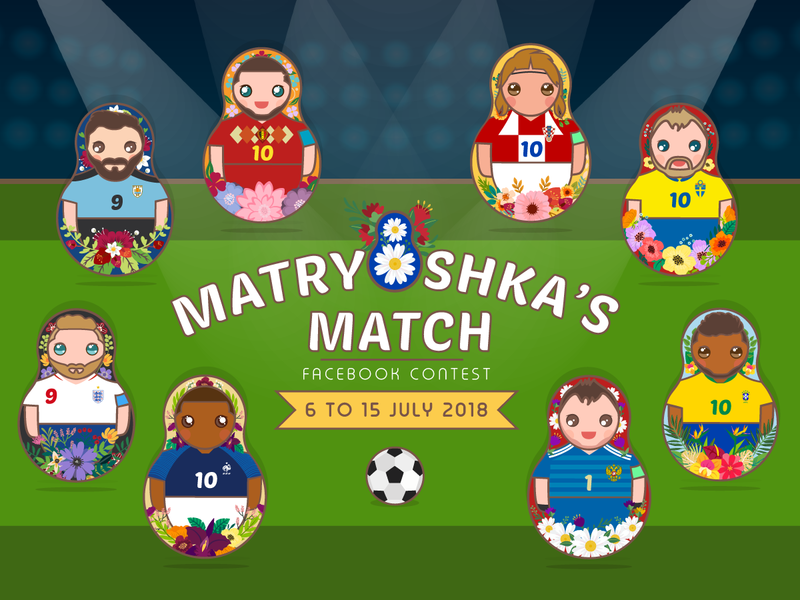 This contest is ‘Matryoshka's Match’ and ‘the contest period’ is from 6 to 15 July 2018 (11:59pm), inclusive. Twenty-five (25) winners from Facebook will each receive 4 tickets to Singapore Garden Festival and a $10 retail/dining voucher. Participants must be over 18 years of age at the start of the contest period, must have a valid public Facebook account (for verification purposes) and must be a follower of Northpoint City’s Facebook page. One (1) eligible entry by a participant consists of (a) a screenshot of all the Matryoshka dolls with their jersey tops and bottoms correctly matched, and (b) a creative cheer of their favourite World Cup team. Both parts should be submitted together as a comment on Northpoint City's Facebook contest post. A maximum of one (1) entry per person is allowed for this Facebook contest. Where a participant submits two (2) or more entries on Facebook, only the last submission will be accepted and the earlier entries will be void. 4. The official time is Singapore Facebook time. Any entry posted before the start of the contest period and after the cut-off time will not be considered. 5. At the end of the contest period, all eligible entries will be compiled. Among those who submitted a screenshot of the Matryoshka dolls with all their jersey tops and bottoms correctly matched, the Management of Northpoint City will select twenty-five (25) winners based on their favourite creative cheer crafted by participants. Winners will be announced on 18 July 2018 via a winners' announcement post on Facebook. 6. For avoidance of doubt, the eligibility of all entries would be subject to the Management of Northpoint City’s decision. 7. All winners will be determined by the Management of Northpoint City (whose decision shall be final) after the closing of the entry period and notified via the announcement post on Northpoint City’s Facebook page. 8. All participants selected as winners in this contest must contact Northpoint City via Facebook page Direct Message by 22 July 2018. Selected winners must provide the first and last two characters of their NRIC eg. S9XXXXX8Z, Full Name as per NRIC, E-mail address, Contact Number and Date of Birth for verification purposes to determine their eligibility for the prize. 9. Prize collection will be at 930 Yishun Avenue 2, #B2-13, Centre Management Office, Northpoint City, Singapore 769098, Monday – Friday (excluding public holidays), 9am to 5:30pm (avoid 1pm to 2pm). Winners must bring along their NRIC for verification. Collection on behalf is allowed, representative must provide full details before collection and bring along their NRIC, winner’s NRIC, and the original authorisation letter upon collection. Prizes cannot be mailed or delivered to winners. 10. Each prize is awarded conditionally upon acceptance and if a winner is uncontactable by 22 July 2018, a supplementary winner may be drawn at the Management of Northpoint City’s discretion. 11. If any prize is unclaimed or declined by the end of the prize collection date, the prize shall be deemed as unclaimed or unaccepted. The Management of Northpoint City will not be responsible should any winner fail to redeem the prize within the specified date. 12. The Management of Northpoint City assumes no responsibility and is not liable for any costs, charges or expenses which a winner may be required to pay at any time in connection with the prize or in order to attend a prize presentation or prize collection. 13. The Management of Northpoint City reserves the right to provide substitute prize(s) of similar value should the specified prize becomes unavailable. Cash will not be offered and the prizes are not transferable. 14. In the event of actual or suspected fraud or abuse, such as but not limited to plagiarism, and/or errors affecting the proper operation of this Contest, including the allocation of more prizes than are available, the Management of Northpoint City reserves the right to (a) end or suspend the Contest, (b) amend these terms & conditions, (c) declare void the notification of winner(s) and reselection of winner(s), or any combination of these resolution methods. 15. Data of each participant will be collected, stored and processed for the purposes of administering and assessing this Contest. By joining this contest, participants consent to and grant Northpoint City and the malls of Frasers Property the right to use the contest submission (images/videos) for marketing, promotion and/or advertisement purposes, including print, audio-visual and social media, without restriction or limitation and for unlimited number of times. 16. All matters relating to the Contest is final, conclusive and binding on all participants and no correspondence will be entertained. 17. The Management of Northpoint City reserves the right to suspend, cancel or amend the promotion and/or review and revise these terms and conditions at any time without giving prior notice. By continuing to take part in the contest subsequent to any revision of these terms and conditions, each participant shall be deemed to have agreed to any such new or amended terms.